1盎司2012年加拿大枫叶泰坦尼克密印银币 The reverse depicts the effigy of Queen Elizabeth II (year of issue and 5-dollar face value are also shown). 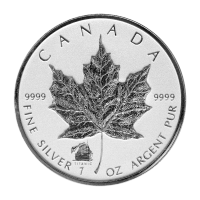 As with all Canadian Silver Maple Leaf coins, the 2012 Titanic Privy design includes the series hallmark assurance: "Fine Silver 1 oz Argent Pur" on the leaf face and the Titanic privy mark on the bottom left side of the leaf. These reverse proof coins feature a privy mark of the R.M.S. Titanic to the bottom left of the maple leaf's stem. This coin has an extremely limited mintage of only 25000 worldwide. This coin was struck to commemorate the 100th anniversary of this infamous tragedy.